into the mouth of his King Henry V, died; and it might even have been the day he was born. George killed the dragon. Most people know this (you’ll find the story below) – there are images and statues of it all over the world. George is usually associated with attributes like bravery, gallantry and honour – characteristics that we English like to aspire to, but which are possibly not uniquely English. Worse, England has to share George with several other places, including Aragon, Catalonia, Georgia (the country, not the US state), Malta and Gozo, Portugal and Romania. George is the patron saint of Scouts, too, and is also said to help sufferers of syphilis. His flag, a red cross on a white background, is the national flag of England, incorporated into the flag of the United Kingdom, the Union Flag, or Union Jack, which in turn is included in the flags of a score or so other nations and territories, including Australia, New Zealand and Hawaii. 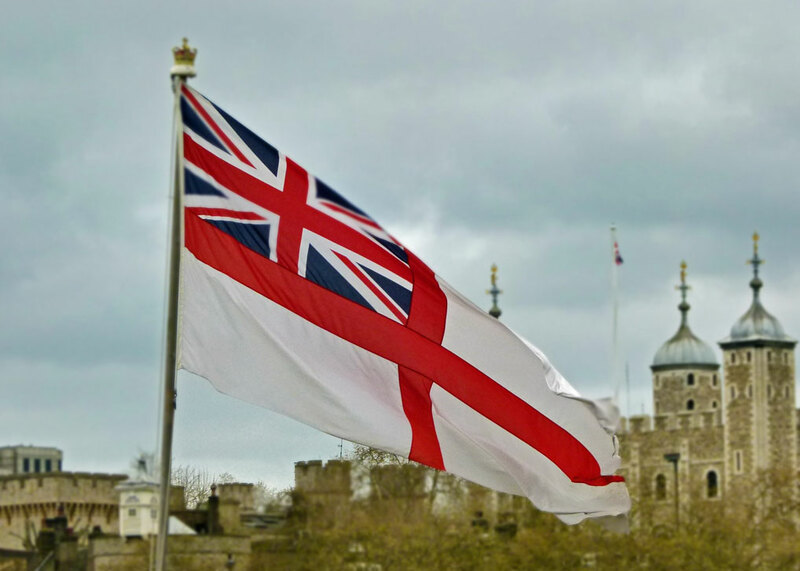 Further, the cross of St George is featured on the White Ensign flown by the Royal Navy, as well as on variants used by other navies around the world. So George is a global presence. Yet when I read on a US website purporting to offer information about Britain, including England, that St George’s Day was a favourite holiday and widely (or was it wildly?) celebrated, I inwardly raised an eyebrow: because St George’s Day is not a holiday (or it wasn’t the last time I looked) and is not widely celebrated, not even in England. On the contrary, most English people don’t even notice it – but on the other hand many are happy to go out and get bladdered on St Patrick’s Day, 17th March, allegedly celebrating the patron saint of a foreign country (albeit a jolly nice one). In fairness, I suspect drinking to St Patrick is more about any excuse to go to the pub, rather than particularly supporting the Emerald Isle, or anything else remotely subversive. All of this opens up a potentially adversarial, but interesting, debate about nationalism (there, I’ve used the ‘n’ word), patriotism, tribalism and the relevance or danger of these things in a modern world. The fact is, I suspect that many English people (whatever that means) are confused about their identity. But first, let’s find out a bit about St George. It is generally agreed that George existed and that we don’t know much about him. There are various accounts of his life, including one that he was George of Cappadocia, a mid-4th century Bishop of Alexandria, but the most common belief is that he was a Roman soldier. I will attempt to synthesise the various popular legends in circulation. George was born to Christian parents, Gerontius and Polychronia (the original multi-tasker?) sometime around 275–285AD, somewhere in what is now modern Turkey – possibly in the Anatolian province of Cappadocia. Some sources suggest that his mother came from the Palestinian town of Lydda (now Lod in Israel) and that Gerontius had a successful career in the Roman army. George too joined the army, rising to the rank of Military Tribune (apparently equivalent to Colonel), serving in Nicomedia (modern Izmit in Turkey), which the Emperor Diocletian (245–313AD) had made his eastern capital. Early in the 300s, Diocletian, hitherto typically tolerant of various beliefs, was persuaded that Christian soldiers on parade were offending the gods by making the sign of the cross and ordered that they should be expelled from the army unless they sacrificed in the traditional Roman way. The story goes – and it cannot be verified – that George strongly objected to this and ignored various attempts on the part of the powers that be to not make such a fuss about it. When it reached a point where George’s challenge to the Emperor’s authority could no longer be tolerated, he was hideously tortured and, when he refused to deny his faith, he was decapitated on 23rd April 303AD. George was canonised by Pope Gelasius in 494AD. The legend of George and the Dragon may be based on a story older than the legendary George himself. Nor did George have a monopoly in the dragon-slaying department; St Michael, the Anglo-Saxon hero Beowulf and the German hero Siegfried, among others, all had a certain way with unruly serpents. There are dragon stories all over the place. They often represent the triumph of good over evil; in Christianity, the dragon is sometimes seen as a metaphor for Satan. The dragon may have had particular significance to ancient Britons, however – and of course the red dragon is a symbol for Wales and features on the Welsh national flag. Once upon a time there was a town in Libya called Silene where, next to a stagnant lake, lived a hungry dragon. The dragon was covered with hard green scales that could not be pierced by sword or spear, and had breath so foul it would clear a sewage-workers’ convention. To keep the dragon fed, the townsfolk brought it two sheep each night. Eventually, they ran out of sheep and had to resort to virgins, who were chosen by lot. All went well with this new arrangement until, one day, the king’s daughter, Sabra, was selected. The king offered substantial bribes to release his daughter from her predicament but the villagers, who had by this time sacrificed many of their own children to the psychopathic reptile, were having none of it. So, at dinner-time, Sabra was duly led to the appointed place, tied to a stake, and left to her fate. Just when things were looking really desperate, George came riding by and, seeing the weeping girl, naturally asked her what was up. Sabra explained, but urged George to ride on before the dragon appeared and ate him too. But our George was made of sterner stuff. Ignoring the water streaming from his eyes as a result of the creature’s halitosis, he thrust his spear, called Ascalon, into the beast’s mouth and killed him. The king was so chuffed, he told all his subjects to become Christians and built a whopping big church. George and Sabra married, retired to Coventry(?) and lived happily ever after. In some versions of the story, George promises to slay the dragon only on condition that the townsfolk convert to Christianity – but I think that seems a little small-minded, don’t you? You won’t be surprised to hear that this is not an easy question to answer. Nor are the specifics behind George’s rise to stardom clear. The fact that George was not English, never even popped in for a cuppa and had no known association with England whatsoever, was obviously no hindrance to him being adopted as the nation’s official saint; apparently, he merely needed to embody the appropriate characteristics, reflecting what were deemed to be English virtues. Deep-down, we’d all like to rescue damsels in distress. Though there are early references to St George in England – including one in the 9th century will of Alfred the Great to the church of Fordington, Dorset, thought to be the first church in England dedicated to St George – the cult of St George (if it can be called that) was not thought to have taken off until returning crusaders brought back his story, popular with the Eastern Orthodox Church, from the Holy Land. It was claimed that a vision of St George inspired men into battle, though their ultimate loyalty would have been to a feudal lord rather than to any meaningless notion of ‘nation’. Earlier saints said to have had significance for the English include St Edmund, martyred king of East Anglia, and Edward the Confessor – though what meaning these men would have had for Normans it is hard to say. The red cross on a white background is not, of course, unique to St George; it was used by, amongst others, crusaders and the Knights Templar. It seems that it was King Edward III who put George at the centre of England, in c1348, by founding the College of St George at Windsor and associating it with the elite Order of the Garter. Even now, this is the highest order of chivalry and the third most prestigious honour (after the Victoria and George Crosses) in England and the United Kingdom. 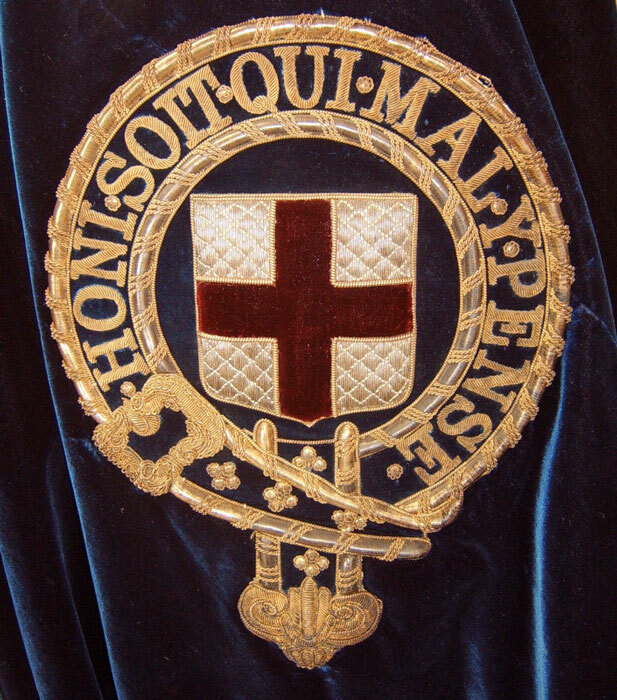 The arms of the order feature the cross of St George, surrounded by the gold and blue garter containing the motto honi soit qui mal y pense (shame on him who thinks evil of it). The badge shows George slaying the dragon. Henry V, the first English king since Anglo-Saxon times to use English in his official letters, is said to have invoked St George at the Battle of Agincourt in 1415. Apparently, by Tudor times, the flag of St George was being flown from the monarch’s ships. Having read the above, if you’re any the wiser as to exactly why, and when, George was adopted as England’s patron saint, good for you; personally, I think it’s all a bit vague and needs further research. Does St George matter, anyway? Growing up, I knew the story of George and the Dragon, but, equally, I knew the (interestingly, less martial) stories of St Andrew and St David, patron saints of Scotland and Wales. The Cross of St George was not the real national flag, was hardly ever seen, and I had no idea that the red rose was supposed to be England’s national flower until I was an adult. Quite frankly, in those far-off days, even anyone flying the Union Flag in England, with the possible exception of Her Majesty the Queen and her representatives, was thought to be, at best, eccentric, if not mildly unbalanced. It’s not that we weren’t patriotic – far from it; we just didn’t shout about it. Having been briefly hijacked by extremists, nationalist thugs (as I suspect many national flags have been), the Cross of St George seemed to emerge, blinking in the sunlight, sometime in the 1990s. For awhile, it was everywhere. 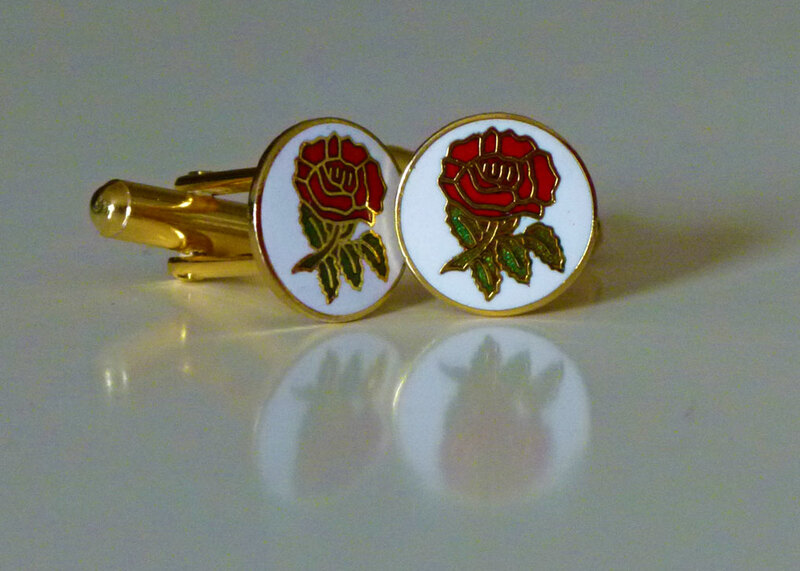 St George’s Day became news – I remember attending a sort of corporate St George’s Day event in London, and even bought a cheap pair of red rose cufflinks while I was there. You will find celebrations and parades held in 21st century England, notably in London, Manchester, West Bromwich, as well as in other towns and villages; and there are those who would like St George’s Day to be a holiday in England, as St Andrew’s Day is in Scotland. But are things quieter now? In the 1990s, St George’s Day cards suddenly appeared in card shops and were available well into the 2000s; but a 2017 expedition to our local town to find one for this article just drew blank stares. The Cross of St George still flutters from church steeples and makes outings at football matches, and even some elections, though it generally seems to be keeping a fairly low profile. So does George, and indeed other saints, have any relevance today? 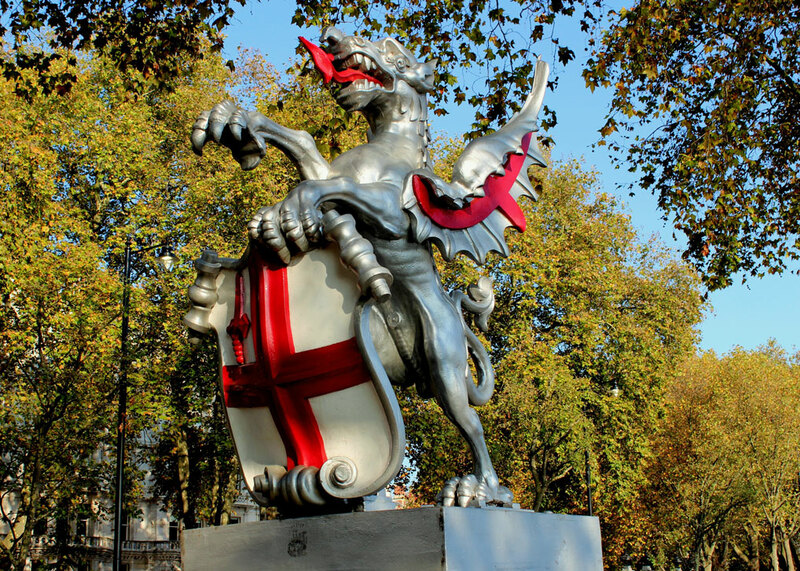 Are St George’s Day events held primarily to attract visitors? Do we need reminding who we are? Do we actually know? Humans are by nature tribal, and I guess most of us are members of clubs of one sort or another, official or otherwise. I have discovered there is a Royal Society of St George, founded surprisingly recently, in 1894, “with the noble object of promoting ‘Englishness’ and the English way of life”. This begs at least one question – what on earth is the nature of Englishness? It’s a huge question, and one that of course any nation could ask of itself, but hard to answer in the context of a long British heritage and United Kingdom. The English do not even have a national dress (unless it’s something with clogs, handkerchiefs and bells) and probably have a less obvious sense of national identity than the Scots or the Welsh. I asked some good friends the other day and a debate developed which included much uncertainty and nostalgia, plus the helpful suggestions of ‘queues’ and ‘bowler-hats’. Maybe it’s a possible topic for a future article in A Bit About Britain. What we will definitely do in due course is a bit about St Andrew (St Andrew’s Day is on 30th November) and a bit about St David (St David’s Day is on 1st March). Englishness? Understanding “wotcher!” and “ey-oop!” and “gannin’ canny” and “thaht beyorrn” and all the other bits of patchwork that make Englishness. Yes, even the scraps that make up us Colonials. In my case, a few “laps” as well! Catching up from my travels Mike, and learning about St. George. He’s always been a bit of a vague mystery to me compared to St. Andrew, St. Patrick and St. David. And somehow a bit of a stuffed shirt – is that part of Englishness, or is that me being too critical? Anyway, believe it or not, the last place I saw anything about St. George was in Basel, Switzerland, where there’s a sculpture of St. George slaying the dragon on the front of the Basel Minster! An interesting post, it covers ground that I did not know about. I love the photo of the flag flying off HMS Belfast. These days, reserved youths are checked to see if they’re quite well. I enjoyed reading this post so much that I even read it to Mr. C. while we were on our walk the other day. I’ll have to admit that it kind of dispels the romance of St. George, but I’m a firm believer in England (and we all know the difference between England and the UK), but probably the England of the 1930s and1940s. I might be stuck there, having read Agatha Christie, All Creatures Great and Small, and Mrs. Milburn’s Diaries, among other things (lots of other things.) And I do believe there are parts of England that have changed little since those times. That is a compliment. Thanks for a great post. Oh. Mr. C’s contribution to the list: black taxicabs, red double-decker buses, and mine would be the iconic RED phone box and any ‘English’ cathedral or Norman church. That’s wonderful, Judy. I reckon the England of the 30s and 40s depends who you were – though I know what you mean; I bet the place is cleaner and smells better now, though! And I’m afraid it has changed terrifically…though it may not always look that way. Great suggestions – no shortage of good ideas! Here in Maine, our hillside looks over the St. George River, which runs from Lake St. George, and merges with the ocean near the town of St. George. Our local cement company is aptly named Dragon Cement. Yet, I’ve never known anything about poor George other than his relationship with a dragon. Thanks to you, I feel a bit better acquainted with him. As far as nationalism goes, I seem to have missed that particular gene! That’s really interesting; how did he get there?! Hitched a ride on a dragon? So good and most interesting to read your post here Mike. I love the image showing the white cliffs of Dover! Thanks, Jan – a borrowed image from Pixabay on this occasion. We do need an English identity, quite separate from our adjoining nations .. and to take back the flag from the extremists. What is wrong with a bit of national pride. Absolutely nothing; though, personally, I draw the line at nationalism, which invariably ends in tears. I still have the very tattered and faded Union Jack that my dad flew on our flagpole when Prince Charles was born. I was 2 at the time. Perhaps it was flown when Princess Anne was born too…. I really can’t remember. Suggestions for Englishness: Grand National; steam trains; bowler hats and umbrellas; pickled eggs; pork pies; Branston pickle. Oh, just remembered, the last jar of Branston that I bought was made in the USA. Excellent suggestions; you get Branston pickle made in the USA – I’m shocked; but then I guess we nicked rock ‘n’ roll? Very interesting post – did not know anything about St George. Englishness – queuing? I’m not sure many English people know about him either. Hi Mike, Great post and very informative! Goodness, being American, I don’t dare try and define “Englishness.” I think probably many Americans have their own idea of what is English — for me I think of beautiful gardens, David Austin roses, hedgehogs. tea and scones, pub food, very dry sense of humor, and Yorkshire pudding. 😉 How’s that? Probably not very accurate, but anyhoo, I tried. Here in the U.S., people fly their flags frequently. It’s a difference in cultures, I’m sure. I hope you have a great weekend! Great suggestions, thanks Denise! Yes, I noticed the flags when visiting the States; I think you see the Scottish Saltire flying in Scotland more than the George Cross in England. Canada is celebrating its 150th birthday this July. Babies we are, and as for a lot of background stories about how we evolved, well, there is quite a bit of hype surrounding the Pacific Rail. And of course there are a few characters that stand out in all the French and British battles that made Canada what it is today. It’s all very factual, no slaying of dragons or anything overly interesting. History is what makes the English so fascinating to me. Walking into a shop that is in a 400 year old building boggles my mind and I’ve yet to do so. If we find something that old around here, it might be a clay pot or an arrowhead, nothing so incredibly tangible. My daughter at one time, and maybe she still does, wanted to grow up to be English. She had the accent down by the time she was 10, and thought that she sounded far more intelligent than anyone else. Richard was very surprised to see how much St. Patrick’s Day is honored here in America but hardly anyone knows of St. George’s Day! Also, try telling someone that St. Patrick was not from Ireland either! Yes, we like to think we have a particular sense of humour – I’m impressed you spelled it that way, Kay! add: tea cosies, hedges and the Women’s Institute. Yes, of course – thank you, Mary Jane! 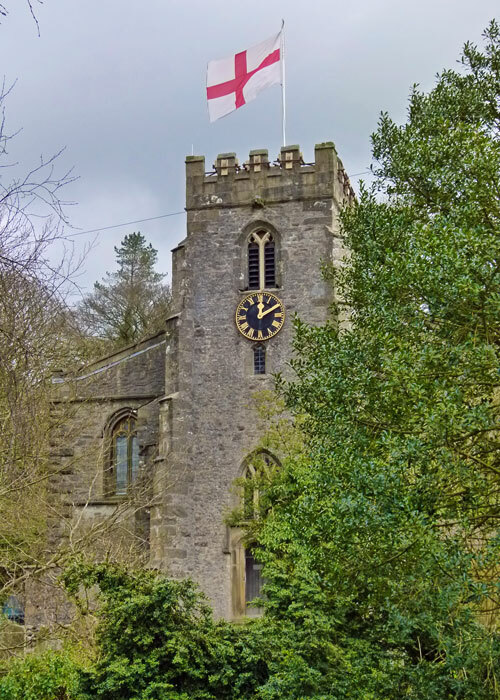 A friendly vicar in N.Yorks enlightened me that it was The Church of England that was allowed to fly the red cross on white flag. Back in the day we were a bit more sniffy about when even a Union flag could be flown ( Royal birthdays etc). Now, as they say, anything goes! One of Britain’s most popular dishes is Lamb or Chicken Tikka Masala. As for drinking too much, I’m afraid that has been a problem for years. Some of Britain’s town centres are not very nice late at night. Quite an interesting post, have no suggestions for future posts except stiff upper lips. Well researched. George is well represented in many a church name to this day. The only time I’ve seen the flag flying though here has been during World Cup tournaments. And George & Dragon pubs – I forgot to mention those! Very well researched, Mike and an extremely enjoyable read as always. Clare…. I had forgotten about the Four Yorkshiremen, thanks for the reminder…. Brilliant stuff from my younger years! Great suggestions, Clare – especially the Four Yorkshiremen sketch!